Ahh, diamonds. Everyone knows what diamonds are, but most might not realize what they once were--chunks of dark, nondescript carbon similar to charcoal, roasting and rumbling around deep within the earth. Fortunately, through eruptions and other harsh works of Mother Nature, diamonds eventually find their way to the surface for man to find, cut, polish, and enjoy. Talk about an ugly duckling turning into a swan! Named from the Greek word adamas, meaning "unconquerable", diamonds are renowned for their impeccable hardness and stellar brilliance and the birthstone for those born in April. polish luster, OTL RI, SR nature, magnification, positive reaction to diamond tester. Weak to strong ADR sometimes with parallel or cross-hatched patterns. No see-through effect.Type IIb blue diamonds are electrically conductive. SWUV: Colorless: commonly inert or weak to strong blue but could be any color;Occasional phosphorescence of 30 seconds or less.Red stones: Inert to faint blue.Red Type II stones: inert to medium to strong orange.Blue Type IIb: rarely weak red to orange-red, occasionally blue to greenish blue and phosphorescence is blue to green and occasionally red to orange red.Blue Type IIa: sometimes weak to strong blue, greenish blue, green, yellow or orange.Orange, yellow and brown stones: Inert to faint blue.Gray or black stones: Inert to strong blue is usual but can be any color. LWUV: Colorless: commonly inert or weak to strong blue but could be any color, generally a stronger reaction than under SWUV; Occasional phosphorescence of 30 seconds or less. Red Stones: inert to medium to strong blue.Red Type II stones: inert to medium to strong orange.Blue Type IIb: Inert.Blue Type IIa: sometimes weak to strong blue, greenish blue, green, yellow or orange.Orange, yellow or brown stones: inert, faint to moderate to strong blue.Gray or black stones: Inert to strong blue is usual but can be any color. Diamonds can have naturals, naturals with trigons, bruted girdle surface if not faceted, bearding, sharp facet junctions, angular mineral inclusions, parallel growth marks, color zoning, internal graining. Natural pink diamonds show strong strain patterns when view using magnification and polarized light. Red stones often have uneven parallel bands of red or pink and blue stones have blue and colorless zones. Yellow stones might have yellow and brown graining parallel to octahedral crystal faces and might form a cross hatch pattern. Blue Type IIb diamonds are most often free of mineral inclusions, but sometimes can have opaque black inclusions; whiteish transparent graining. Blue Type Ia and IIa diamonds might display color zoning near can be located near surface of the stone close to radiation stains. Green stones often have large naturals because the color is sometimes confined to the surface due to natural radiation staining. 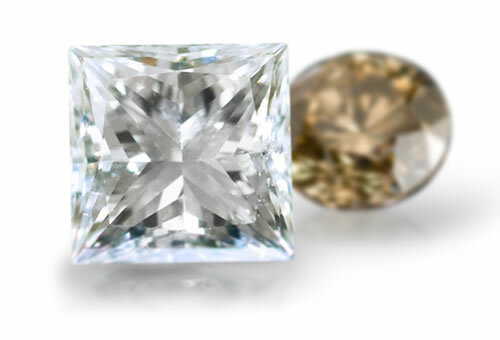 Yellow or orange stones might blotchy yellow color zones that are darker at the center and have polish lines that are never oriented the same way on adjacent facets.